The intellectual legacy of Confucianism has loomed large in efforts to understand China’s past, present, and future. While Confucian ethics has been thoroughly explored, the question remains: what exactlyis Confucian political thought? 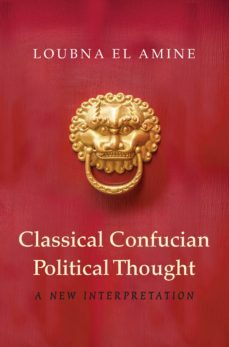 Classical Confucian Political Thought returns to the classical texts of the Confucian tradition to answer this vital question. Showing how Confucian ethics and politics diverge, Loubna El Amine argues that Confucian political thought is not a direct application of Confucian moral philosophy. Instead, contrary to the conventional view that Confucian rule aims to instill virtue in all members of society, El Amine demonstrates that its main aim is to promote political order.El Amine analyzes key aspects of the Confucian political vision, including the relationship between the ruler and the people, the typology of rulers, and the role of ministers and government officials. She also looks at Confucianism’s account of the mechanisms through which society is to be regulated, from welfare policies to rituals. She explains that the Confucian conception of the political leaves space open for the rule of those who are not virtuous if these rulers establish and maintain political order. She also contends that Confucians defend the duty to take part in government based on the benefits that such participation can bring to society.Classical Confucian Political Thought brings a new understanding to Confucian political theory by illustrating that it is not chiefly idealistic and centered on virtue, but rather realistic and driven by political concerns.